Plants, trees, and flowers. So much to learn and crafts are a great way to learn about God’s creation. Here are some simple crafts for kids who are ages 1-3. – Keep the steps simple, usually three steps or less. – Add textures such as cotton balls, fabric, yarn, pom-poms, and tissue paper. – Include stickers or ink stamps and don’t forget the glue or glue sticks! For larger classes or if your time is limited, trace an arm/hand on a page of construction paper. 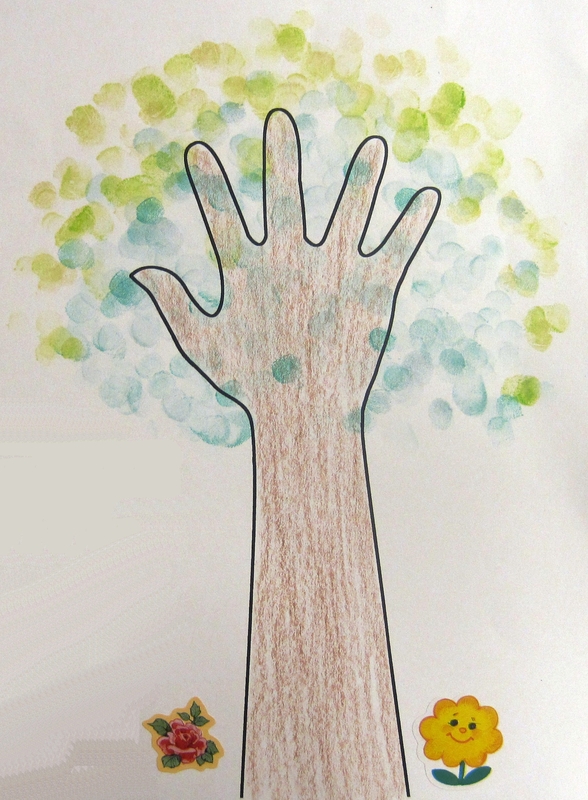 For small groups, take the time to trace each child’s arm/hand onto the paper. Have children press their fingerpad into an ink pad and press it on the paper many times for leaves. Add flower stickers for extra decoration. * Can be used for the story of Zacchaeus or Moses and the Burning Bush. Cut two pie-shaped pieces out of an unwaxed paper plate. 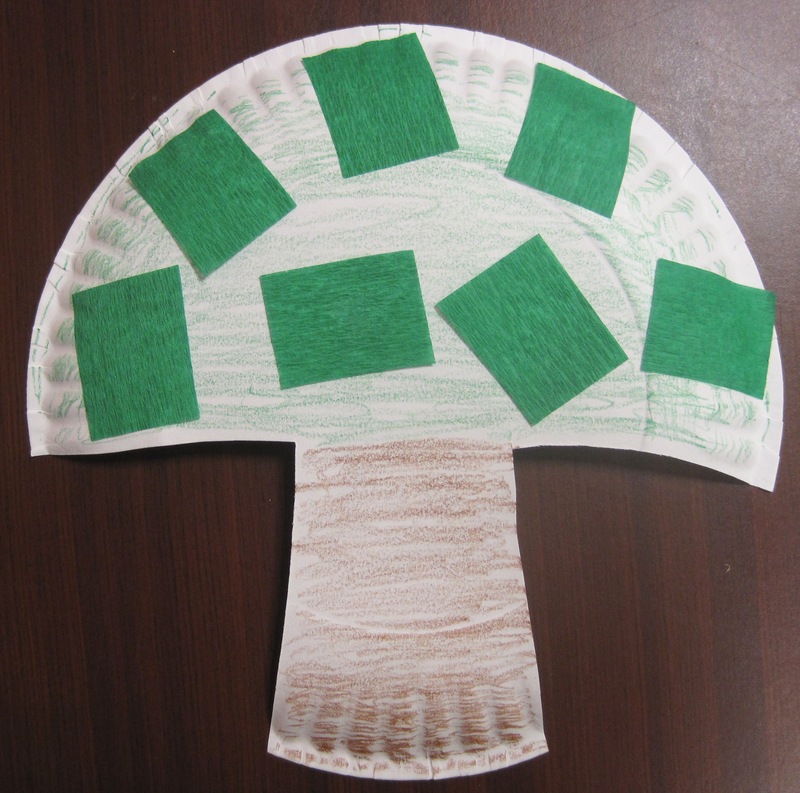 Give children squares of green construction paper, tissue paper, or crepe paper to add leaves. Use larger squares of tissue paper and have children crumple them before gluing them to the tree. 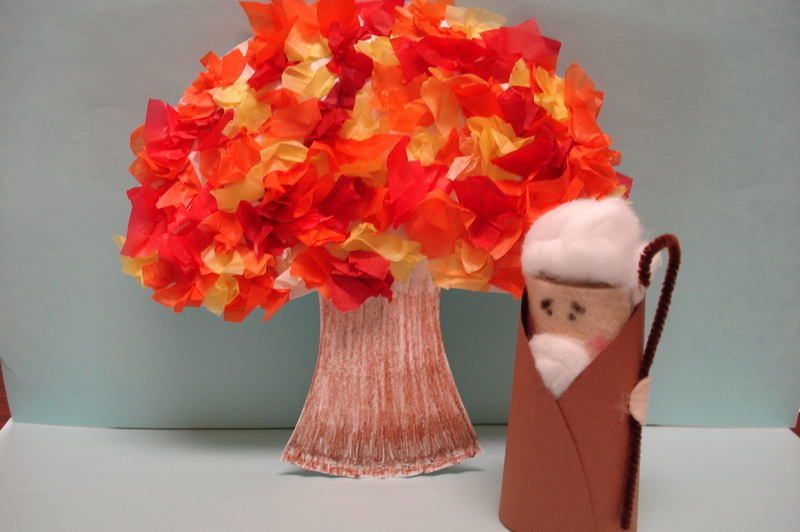 Use orange, red, and yellow paper squares for fall or for the burning bush. Interested in Moses? He’s made from a toilet paper roll, peach felt (square for face and circle for hand), brown construction paper, cotton balls, and a brown pipe cleaner for a staff. Download template for cloak here. can u tell me how you made the Moses? he is Adorable!!!! Thanks for coming by! Moses is made using a toilet paper roll with brown construction paper (felt could be used) wrapped around him for a cloak. The face is a square of peach-colored felt and the hand is a circle of peach felt. I have a template for the cloak which I will add to this page. The lesson that goes with the burning bush craft (Moses is not included) can be found at Resource Well: http://www.resourcewell.org/children-ministry/lesson/lesson_40_the_burning_bush_4-5.